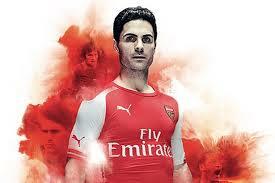 This is a brief blog about Mikel Arteta. Spain, Rangers, Arsenal – right midfield, central midfield, defensive midfield blah blah. You all know his evolution so I will spare you a history lesson. I believe that Santi performs brilliantly in a role designed for Arteta. It’s more defensive than that of The Snake when he was with us and definitely not the traditional defensive midfielder that the cool kids call ‘DM’. Arteta did, however, play that role without the help of Coquelin so perhaps the earlier part of this paragraph is nonsense. Regardless, the job to which I’m referring is that of the tactical leader. Arteta had the intelligence, touch and composure to play the role masterfully. El Capitan (Spanish for ‘the captain‘) has made a couple of substitute appearances for us this season in which he burst onto the pitch like a bull in a clichéd reference to Spanish culture. He came on in the game against Chelsea and within minutes found himself in a heated exchange with their midfield. This was a man pumped up and ready to fight for however many minutes he could get on the pitch. Against Palace, Arteta didn’t immediately replace the outgoing Coquelin but did feature and went straight into his position at the base of midfield. Again, the skipper came out all guns blazing. He made tackles in our box and steadied a ship rocked by its midfield base being excused by the manager. Arteta still has legs. I saw them on Sunday, they still exist. He isn’t quick on his feet but then I don’t think he needs to be. Tactical nous is what Arteta will live on for the remainder of his career and it could be the difference in many games, as it may have been on Sunday. It remains to be seen how much football he’ll play this season but I at least expect to see him make many substitute appearances. Footballers age at a dramatic rate and the good ones constantly evolve mentally as their bodies deteriorate. Arteta has done that his whole playing career and, as he heads down the home stretch, which this undoubtedly will be, he will adapt smoothly to his new role of full-time captain, part-time player. He is too intelligent, too resourceful and too determined a man to let it go any other way. Arteta continues to be a great servant for Arsenal Football Club. And looking through the fixture list this Saturday not a particularly exciting set of fixtures until Monday evening Fins. The pick of the bunch is probably Everton v Citeh on Sunday afternoon and I expect the Merseysiders to give Pelligrini more problems than they encountered last week against Chels. The other game which may be worth a watch is the third meeting between Bilbao and Barcelona in a fortnight, Pique giving that one a miss after his little outburst midweek.